This term I’ve been working with Year 2 at Miers Court Primary. Their topic for the term is Medieval Castles and, in dance, I chose to focus on parts of the castle and a Medieval style sequence dance that the pupils could perform at a special event at the end of term (more on that later). Battlements, towers, buttresses, draw bridges and moats, every part of the castle had a movement or shape in warm up and a different movement or shape for cool down. There were also bows to “THE KING” and Jester jigs. I was pleased to hear from Miss Baldock, one of the year 2 teachers, that whilst in the classroom learning about jobs in the castle, the children were able to tell her what the Jester’s job was. I taught some sequence dances, The Pavanne, The Circle and The Chain that I adapted so they could be performed as one dance. At the end of term there will be a medieval style Banquet held for the Year 2 classes. 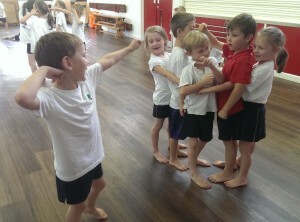 Entertainment will be the dances they’ve learnt and choreographed with me. In groups, The Great Hall, the draw bridge, the ramparts and the portcullis were turned into freeze frames. 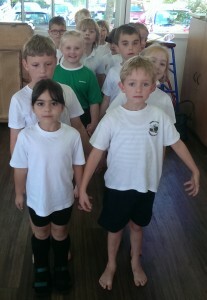 Year 2 learnt that to make a good freeze frame you need to use different levels, facial expressions and interesting hands and feet. Then they added linking movements to turn their shapes into a motif. I’ve had a fantastic time working with Year 2. I think they’ve learnt a lot about medieval castles as well as dance. They’ve come a really long way. The first week they found it hard to do the step together in The Pavanne. By the end they had a whole dance of step togethers! They should be very proud of themselves. The photos are in our gallery (http://www.therightstepdc.co.uk/gallery-2/medieval-castles/) and here’s an automatically created video, an Auto Awesome, about the project.